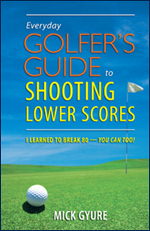 Everyday Golfer’s Guide to Shooting Lower Scoresbook is written by someone who has been there and understands the challenges facing golfers who are struggling with their game. Mick Gyure is an everyday guy who started playing golf in his mid-thirties. Like most novices, he initially struggled to improve his game. Ultimately he focused on specific objectives which allowed him to achieve his goal of breaking 80!